Incredible rarity, being one of the toughest years to find for Franklin in Cameo condition! This is the highest grade in Proof and 1 of only 13 graded by NGC! Rich, pitch-black mirrors create stunning, mirrored perfection. Haze-free, deep, black pools are simply the start for this gorgeous Franklin! The obverse devices display lightly frosted features creating a light glow against the deep mirrors. The reverse offers a hint of frost as well, however, not enough to crack that Cameo grade! 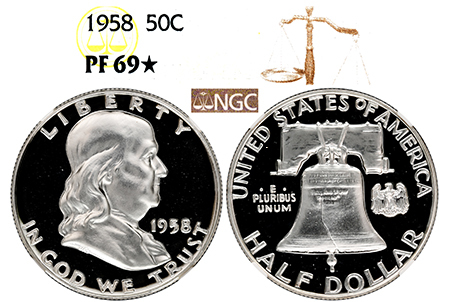 Rare Cameo devices coupled with pristine PF 69 condition make this beauty a true gem!